Emerson’s Rubber Buffing Machines help you prepare elastomer samples to a uniform thickness in accordance with the ASTM 3183. 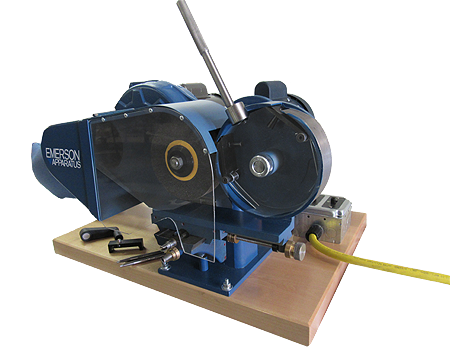 Emerson’s Rubber Flexing Machines help you test for tensile strength, cut growth, air aging, and low temperature aging effects on rubber. Emerson’s Rubber Buffing Machine is designed for preparing elastomer samples to a uniform thickness in accordance with the ASTM 3183 (for performing tensile, air aging as with the Emerson Geer Oven or other physical tests). Features a self-contained suction blower and dust collection bag to take away and collect material removed during buffing, ensuring a dust free work area. Also supplied is a diamond wheel dressing tool to quickly and accurately dress the wheel to a uniform flat rotary surface. A micrometer dial feed, accurate to within .002″, ensures uniform and repeatable results. Platens are necessary to hold the samples for buffing. They are sold as accessories and should be selected based on anticipated testing needs. Platens are available in two different styles and two separate sizes for each style. Flat platens are designed for samples that will lay flat, and the rotary platens are designed for irregular samples that must be held down by wrapping them around a drum. All platens are equipped with a snap clamp for quick and easy installment and removal of samples. Length of buffed area 11″. The Model AR2 Ross Rubber Flexing Machine is designed to determine the resistance of vulcanized or synthetic elastomers to cut growth. It conforms to ASTM Method D1052. A piercing tool is available to make an accurate cut conforming to ASTM D1052. Contact sales for information regarding this piercing tool. The Model AR6 Ross Rubber Flexing Machine is designed to determine the resistance of vulcanized or synthetic elastomers to cut growth. It conforms to ASTM Method D1052. 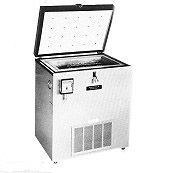 For low-temperature flexing, the AR6 flexer is mounted in a cold chamber capable of sustaining -40°F during operation. Emerson also manufactures aging apparatus conforming to ASTM D572 and D573. Please contact sales for details.